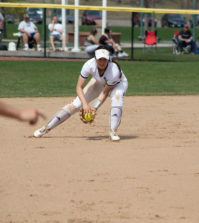 The Quinnipiac softball team (13-26 overall, 4-6 MAAC) fell to the Siena Saints (11-16 overall, 4-3 MAAC) in doubleheader action on Sunday, April 14 at the QU Softball field. Siena came out victorious in the first game 4-2 and the second game 7-1. In the first game, the scoring action came in the second inning for Siena as it took a commanding 3-0 lead. The scoring started when freshman infielder Sabrina Vargas reached on base due to an error that brought sophomore outfielder Neysa Ouellette in to score. A hit from senior first basemen Madysen Cossack would bring in Vargas to score, as well as senior infielder Jessika Jaime, and Siena extended its lead to 3-0 over Quinnipiac. In the third inning, Jaime singled, bringing in junior catcher Amanda Dodson to score making it a 4-0 lead. Quinnipiac tried to rally back after freshman designated hitter Lo Yarnall hit a double, making freshman catcher Hannah Davis and freshman infielder Alexis Otero score which cut the lead in half to make it 4-2. However Quinnipiac couldn’t complete the comeback and the first game ended with a 4-2 victory for Siena. Not much changed in the second game as the scoring didn’t begin until the third inning for Siena. It all started when Cossack delivered a home run over the right- field fence. Then junior outfielder Lauren Sabihon decided to join her teammate as she sent the ball over the left field fence making it 2-0 for Seina. Quinnipiac got on the board in the fourth inning when Otero hit a double, driving in senior outfielder Erin Larsen cutting Siena’s lead to 2-1. In the sixth inning, Siena extended its lead after Jaime hit a sacrifice fly ball, and tagging up was Dodson who just beat out the throw to the plate making the lead 3-1. 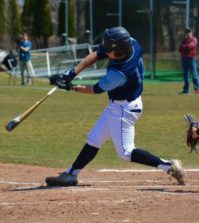 Siena didn’t stop the scoring there so it extended the lead even further in the seventh inning. The scoring started when senior designated hitter Loryn DeFalco hit a single, having Cossack score from second base making the score 4-1. With two players on base, up to the plate was Ouellette. She would join in on the home- run party, driving the ball over the center- field fence making the score 7-1 Siena. Quinnipiac had no response of its own, resulting in a 7-1 loss for Quinnipiac, completing the sweep for Siena. 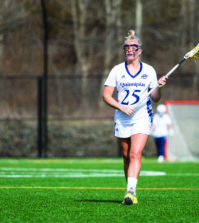 Quinnipiac will look to bounce back at home against MAAC rival Marist starting at 2 p.m. in double header action on Thursday, April 18.